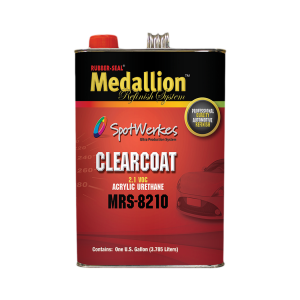 SpotWerkes 2.1 V.O.C.Acrylic Urethane Clearcoat is an ultra productive clearcoat formulated for spot and single panel repair. It mixes 4:1 with MRS-8250 Activator and ready to sand in 20-25 minutes air dry. MRS-8210 SpotWerkes 2.1 V.O.C. Acrylic Urethane Clearcoat is applied wet-on-wet with no flash time between coats. It can also be baked for 5 minutes @ 140°F(54.4°C). Available in quarts and gallons.